Interstate 359 is a short spur linking I-59/20 with U.S. 43 and Downtown Tuscaloosa. The freeway was envisioned as part of an overall highway plan including the Hugh Thomas Bridge across the Black Warrior River and the one-way couplet of Lurleen B. Wallace Boulevards (originally 25th & 26th Avenues) between Northport and Tuscaloosa.1 Interstate 359 runs concurrent with U.S. 11 and Alabama 69 from Skyland Boulevard in south Tuscaloosa to 15th Street, where U.S. 43 enters from near Stillman College. 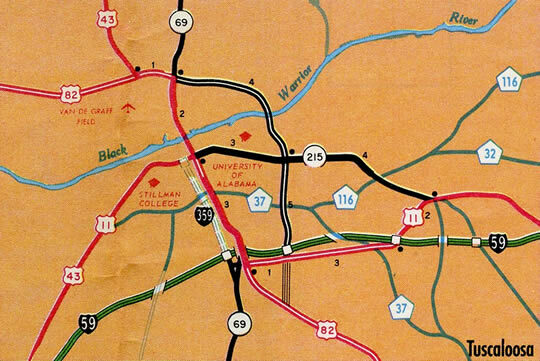 Planning for the Tuscaloosa spur began in 1961.4 Costing $7 million, the Hugh Thomas Bridge between Northport and Downtown Tuscaloosa, opened to traffic on December 17, 1973 in conjunction with the Lurleen B. Wallace Boulevard couplet.2 The first contract (July 1979) for Interstate 359 involved construction of the interchange with I-59/20 and the expansion of the freeway to six overall lanes eastward to McFarland Boulevard (U.S. 82). The second project (October 1979) focused on work to build I-359 between the AGS Railroad and I-59/20. The third project (March 1980) built the freeway viaduct from the AGS Railroad to 15th Street. Work on the northernmost portion, from 15th Street to 12th Street was under contract by September 1980.3 Included in the construction of Interstate 359 was work on 15th Street, which included a viaduct over the Illinois Central Gulf Railroad and expansion of the road from two to six lanes. Construction of Interstate 359 replaced the alignment of U.S. 11 and 82 between Downtown Tuscaloosa and the Taylorville area. The arterial bypass for U.S. 82 was completed in the 1970s while U.S. 11 was realigned away from Greensboro Avenue onto the freeway spur. Shield assembly formerly posted at the turn of southbound U.S. 11 onto I-359 & SR 69 north from Skyland Boulevard. Photo taken by Adam Froehlig (02/01). An interchange is proposed to replace the this intersection, but funding was placed on hold for it in 2018. Interstate 359 northbound enters a diamond interchange (Exit 2) with 15th Street ahead of the freeway transition to Lurleen B. Wallace Boulevard. U.S. 11 south departs at Exit 2 for an overlap south with U.S. 43 south to Stillman College and Eutaw. Photo taken 10/21/12. SR 69 extends north from the I-359 viaduct and combines with U.S. 43 on Lurleen B. Wallace Boulevard at 12th Street. The two routes run along the west side of Downtown Tuscaloosa to the Hugh Thomas Bridge, Northport and U.S. 82 (McFarland Boulevard). Photo taken 10/21/12. Lurleen B. Wallace Boulevard southbound partitions with three lanes ascending onto the Interstate 359 viaduct and a two-lane ramp departing for 15th Street and U.S. 11/43 south to Stillman College and Fosters. Photo taken 10/21/12. 15th Street west at I-359 south, U.S. 11, U.S. 43 and Alabama 69. U.S. 11 and 43 originally followed Stillman Boulevard northeast from 15th Street to 24th Avenue, the old alignment of U.S. 82. Photo taken by Chris Patriarca (04/27/03). U.S. 11 and 43 (15th Street) north part ways at the entrance ramp for I-359 and SR 69 south to I-59/20 and Skyland Boulevard. 15th Street continues east from nearby Greenboro Avenue as part of SR 215 to U.S. 82 (McFarland Boulevard) at University Mall. Photo taken 06/06/17. The I-359 viaduct originating from 12th Street extends across the AGS South District Railroad line, 1.25 miles ahead of I-59/20. Photo taken 06/06/17. The entrance ramp from 35th Street adds a fourth southbound lane for Interstate 359, U.S. 11 and SR 69 to I-59/20 northeast across the south side of Tuscaloosa. Photo taken 06/06/17. U.S. 11 north and Alabama 69 south continue to the freeway end at Skyland Boulevard where they split for Cottondale and Moundsville respectively. Photo taken 06/06/17. A two-lane flyover takes traffic from Interstate 359 south to I-59/20 northeast to Bessemer and Birmingham. I-59/20 combine southwest 80 miles along a rural drive traversing low rolling hills and pine forest to Meridian. Photo taken 06/06/17. U.S. 11 north and SR 69 south intersect Skyland Boulevard and Oscar Baxter Drive beyond the exchange with I-59/359. U.S. 11 parallels I-59/20 along Skyland Boulevard east through south Tuscaloosa. SR 69 travels south 35 miles to Greensboro. Photo taken 10/21/12. 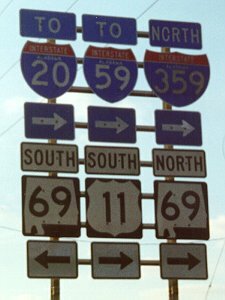 Alabama 69 combines with southbound U.S. 11 at Skyland Boulevard and the northbound beginning of Interstate 359. The span wire traffic light assembly here was replaced with mast arms by 2012. Photo taken by Ed Wilson (02/22/02). I-359, U.S. 11 and SR 69 enter a directional cloverleaf interchange with Interstates 59 and 20 to the immediate north of Skyland Boulevard. Photo taken 10/21/12. A loop ramp follows onto I-59/20 southwest to Eutaw, Livingston and Meridian, Mississippi. Photo taken 10/21/12. Interstates 59/20 travel through a rural area by Friday Lake on the two mile approach to Exit 71 with I-359 north, U.S. 11 and Alabama 69. Photo taken 10/21/12. Crossing the AGS South District Railroad, one mile ahead of the directional cloverleaf interchange (Exit 71) with Interstate 359. Signs for Exit 71 omit U.S. 11, which meets I-59/20 at three of the next five interchanges. Photo taken 10/21/12. Exit 71A leaves the eastbound freeway for U.S. 11 north to Skyland Boulevard and Alabama 69 south to Moundsville. Exit 71B follows as a loop ramp onto I-359 north to Downtown Tuscaloosa and the University of Alabama campus. Photo taken 10/21/12. I-59/20 north reaches Exit 71B for Interstate 359 north, U.S. 11 south and SR 69 north. Connections with the Hugh Thomas Bridge lead motorists north to Jasper via SR 69 and Hamilton via U.S. 43. Photo taken 10/21/12. A $83.4 million project expands I-59/20 to six lanes from Exit 77 (SR 215) to Exit 73 (U.S. 82 / McFarland Boulevard) through 2020. A signature crimson-colored suspension bridge will support the freeway at a new SPUI with McFarland Boulevard.7 A button copy sign for I-359 stood ahead of the U.S. 82 underpass. Photo taken 06/12/08. I-59/20 proceed west from U.S. 82 (McFarland Boulevard) with six overall lanes to Exit 71B for Interstate 359, U.S. 11 and Alabama 69. This stretch was expanded during construction to build I-359. Photo taken 10/21/12. Exit 71 is the last of five interchanges along I-59/20 for the city of Tuscaloosa. Photo taken 10/21/12. Two lanes leave Interstates 20 west & 59 north for I-359-SR 69 north and U.S. 11 south at Exit 71B. A loop ramp follows for SR 69 south to Greensboro. Photo taken 10/21/12. “Bridge Contract Welcome; I-359 Needed.” The Tuscaloosa News (AL), November 2, 1970. “Bridge, Street Are Dedicated.” The Tuscaloosa News (AL), December 17, 1973. “Exchange briefed on I-359 project.” The Tuscaloosa News (AL), June 1, 1979. “Opening of I-359 applauded.” The Tuscaloosa News (AL), September 14, 1983. “Interstate link speeding traffic flow.” The Tuscaloosa News (AL), October 27, 1983. “Tuscaloosa lane closures at I-59/McFarland Blvd. start Sunday.” WBRC (Tuscaloosa, AL), May 12, 2018.